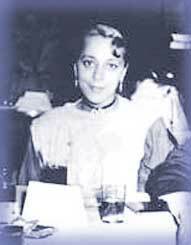 Image: Black businesswoman Viola Desmond faced segregation in the 1940s. Born and raised in Halifax, Viola Desmond trained as a teacher but soon joined her husband Jack Desmond in a combined barbershop and hairdressing salon, a beauty parlour on Gottingen Street. While expanding her business across the province, Viola went to New Glasgow in 1946. In New Glasgow, Desmond developed car trouble and decided to go to the movies while repairs were made. She bought a ticket, entered the theatre and took a seat on the main floor, unaware that tickets sold to African Canadians in this town were for the balcony and the main floor was reserved solely for White patrons. Theatre staff demanded that she go to the balcony, but she refused, since she could see better from the main floor. The police were summoned immediately and she was dragged out, which injured her hip. She was charged and held overnight in jail; she was not advised of her rights. While discussing the incident with the doctor who tended to her, Desmond decided to fight the charges. Clearly, the issue was about her being African Canadian and there being a racist seating policy in place; it was not about tax evasion. In taking the matter to the courts, Viola Desmond's experience helped to galvanize public opinion locally and internationally, and to raise awareness about the reality of Canadian segregation. Scroll down to page 17 for a detailed account of Viola Desmond's extensive challenge to Nova Scotia's segregation laws. From The Historical Construction of Racial Identity and Implications for Reconciliation, by Constance Backhouse, Professor of Law, University of Ottawa. From the canada.metropolis.net website. Photographs of a classroom presentation about Viola Desmond featuring her sister, Wanda Robson. From the website for Riverview High School, Coxheath, N.S. Listen to a CBC Radio interview with Cape Breton resident Wanda Robson about her sister Viola Desmond's brave stand against racial discrimination and injustice. This news story recounts how Viola Desmond's arrest in a movie theatre led to the dismantling of Nova Scotia's segregation laws. From digitaljournal.com. A brief reference to the 1946 Viola Desmond case in Nova Scotia. From the website for the Department of Justice. An article about Viola Desmond's legal battle for racial equality in Nova Scotia. From octopusbooks.ca.